Just released this June, the 4th Edition, 2012; here’s some carping on dc.streetsblog.org that the new guide doesn’t address cycle tracks (bike lanes with physical barrier between the bike lane and adjacent travel lanes). For roadways with no curb and gutter, the minimum width of a bike lane should be 1.2 m (4 feet). 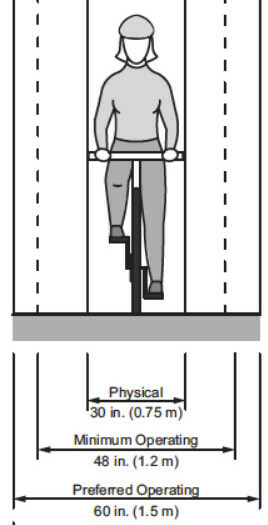 If parking is permitted, as in Figure 6(1), the bike lane should be placed between the parking area and the travel lane and have a minimum width of 1.5 m (5 feet). Where parking is permitted but a parking stripe or stalls are not utilized, the shared area should be a minimum of 3.3 m (11 feet) without a curb face and 3.6 m (12 feet) adjacent to a curb face as shown in Figure 6(2). If the parking volume is substantial or turnover is high, an additional 0.3 to 0.6 m (1 to 2 feet) of width is desirable. The recommended width of a bike lane is 1.5m(5 feet) from the face of a curb or guardrail to the bike lane stripe. This 1.5-m (5-foot) width shouldbe sufficient in cases where a 0.3-0.6 m (1-2 foot) wide concrete gutterpan exists, given that a minimum of 0.9 m (3 feet) of ridable surface is provided, and the longitudinal joint between the gutter pan and pavement surface is smooth. If curb and gutter / no parking: 5 feet from curbface, with a minimum of 3 feet of “ridable surface”, i.e. up to two of the 5 can be gutter pan. If parking: generally 5 feet, see document. By the way, there is a handy extract of the Guide including cross sections diagrams within lesson #15 of FHWA-HRT-05-133 Federal Highway Administration University Course on Bicycle and Pedestrian Transportation. The material is available in both pdf and ppt; and has a whole spectrum of information pertaining to planning bike and ped facilities. “Along sections of roadway with curb and gutter, a usable width of 4 ft (1.2 m) measured from the longitudinal joint to the center of the bike lane line is recommended” (bottom page 4-15). This means that for the common gutter pan width of 1.5′; the new minimum total width is 5.5′ (i.e. 4 + 1.5) whereas it would have been 5′ per the 1999 guide. A similar statement is made about drainage grates; that there must be 4′ beyond the grate. For more about the 2012 Edition, there is a series of webinars/presentations at walkinginfo.org, e.g. the 9/4/2012 one covers bike lane minutia. Also see Wayne Pein’s critique of 2012-aashto-bike-lane-widths. See mcclintock-road-resurfacing-and-left-buffered-bike-lanes for a quotation on the advantages and disadvantages of buffered Bike Lanes. On streets where the bike lane is adjacent to the curb and the curb includes a 1-foot to 2-foot gutter pan, bike lanes should be a minimum of 4 feet wide (width does not include the gutter pan, since bicyclists are typically unable to use this space). In general, 4.2 m (14 feet) of usable lane width is the recommended width for shared use in a wide curb lane. Usable width normally would be from edge stripe to lane stripe or from the longitudinal joint of the gutterpan to lane stripe (the gutter pan should not be included as usable width). Sharing 14′ of space is not wide enough to share — why does the AASHTO continue to promulgate this myth? It then goes on to list several cases where 15′ is indicated, though it discourages wider than that on the theory that cars might then “double up” in the one lane. 14′ is definitely not enough width for general lane-sharing! There’s a great line and illustration in Wayne Pein’s critique of 2012 AASHTO guide, showing that large vehicles cannot safely (or legally) pass a bicyclist side-by-side in a 14′ lane: “It’s a zombie myth that 14 feet is adequate for side-by-side use” and in How Wide Should a Wide Lane Be? notes “The preponderance of research and empirical evidence indicates the width of WOLs (Wide Outside Lanes) should be 15 feet minimum. Where there is significant heavy truck traffic and higher speeds, 16 feet or more should be used”. The 2010 draft guide, link above, has a LOT of extra detail and generally stronger wording, e.g. the 1999 Guide refers to “the recommended width of a bike lane is 1.5m(5 feet)” whereas the 2010 Draft says “the minimum bike lane width is 5 feet…” (empahsis added). The Draft Guide also, by the way, specifies that the measurement is made “to the center of the bike lane line”. The 1999 Guide doesn’t specify. ITE (Institute for Transportation Engineers) also has a guide, see Chapter 14 of the ITE Traffic Control Devices Handbook, 2nd Edition. NACTO Urban Bikeway Design Guide. Note that, unlike any of the guides, the MUTCD is legally binding. This is surprising to some, including me. The thinking is, apparently, that the ground markings are the important piece. Pedbikeinfo.org has a nice presentation-style document outlining all bike+ped oriented changes in the 2009 MUTCD, bikes are part 9. For more explanation, see bicycle (part 9) related FAQs. The term markings refers to the various paint on the ground that may or must be used to mark a bike lane. The stripe is unambiguously and absolutely required — “Longitudinal pavement markings shall be used to define bicycle lanes” (my emphasis added) see 9C.o4 Markings for Bike Lanes, and note that no particular stripe width is specified. However, the painted words or symbols/logos, and arrows are “if used”, which would suggest they are optional. Not so fast! According to the above-mentioned faq, due to Item C in Paragraph 6 of Section 3D.01 the word, symbol, and/or arrow pavement markings are required. Apparently this apparent confusion has already been recognized by the NCUTCD’s BTC (that is, the National Committee on Uniform Traffic control Devices, Bicycle Technical Committee: ncutcdbtc.org) and a fix is in the works. The proposed fix clarifies in 9C.04 that markings are required, by adding them to the standard (thanks to Richard Moeur for pointing this out). The official status of the request 9(9)-26 (and scroll down; the direct link seems to change) — one imagines this can take a long, long, long time if it is granted; and in the meantime it’s not clear what the status of all this is?? [one wonders how long this can possibly take? I just checked in Jan 2015 and the request was received 3 and 1/2 years ago with no end in sight. I inquired 8/2015 and was told due to unfortunate delays, it’s not likely to happen until the next edition of MUTCD, perhaps in 2017(! ), and was in the meantime referred to the FAQ linked above for bicycle markings] Hopefully, it will one day show up as an ‘interim approval‘. A “Longitudinal pavement marking” is defined in 3A.06 : noting that width for “Normal line—4 to 6 inches wide”; I’m sure the color is specified as white somewhere else? There is no particular width specified for a BL stripe. How wide is the bike symbol marking? I just noticed that figure 9C-6 in the 2003 edition has the grid lines for the markings; the symbol is 40″ wide (the word markings are significantly narrower at 32″). I’ve always wondered about that. See this comment below that explains the symbols must always be 40″x72″. These smaller symbols are wrong and are not supposed to be used (since at least 2003? In Tempe I often see a correctly sized symbol sort of superimposed over the vestiges of an older small symbol, so at least they made an effort), here’s a too-small symbol in Apache Junction that was installed 2015. Note that the MUTCD has in some sense the force of law in Arizona, see The MUTCD and A.R.S. There’s a presentation at PBIC How to Create a Bicycle Safety Action Plan: Planning for Safety. 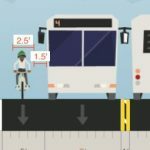 It contains a graphic from the newer AASHTO bike guide as to bicyclist design width: 30″ / 48″ / 60″, which corresponds to a person’s width / minimum operating width / preferred operating width (fig 3-1). and Risk Management: “When traffic control devices conflict with or are not supported by existing standards, the liability is greater”, like, for example, mis-use of urban edge lines; the most popular form of fake bike lanes. In case you are wondering, NCHRP is the National Cooperative Highway Research Program. The last guide skipped 13 years (1999 to 2012); when will the next one come out?? Thank you so much for putting the guidelines on the web. Beats $99 for hard copy AND I was able to quickly resolve the details of an assertion made in a bike/ped workshop for planners and TEs. Actually thanks go to MAG for posting it, but I know exactly what you mean! So the “3 feet of ridable (sic) surface” is not compliant with the 4 feet minimum operating space. Why should bicyclist space be reduced to 3′ of usable surface just because the seam of the unusable gutter pan is smooth! As an aside, I recently wrote a 1 page paper describing what the dimensions in Figure 1 mean. I think i have a pretty good handle on what a bike lane is or isn’t with respect to its physical characteristics like width, striping, ground marking (optional) signs. But, can someone tell me in sort of detail what it mean to “designate” a bike lane? E.g. the phrase “designated as a bicycle path or lane by state or local authorities” shows up a couple of times in our state traffic laws. Ed Beighe http://azbikelaw.org/images/slides/tucsonSabinoCanyonAndSnyder.html apparently there is something more to it than that — i am told by the “local authority” that this, e.g. is NOT a designated bicycle lane; despite the stripe, and ground marking. There are no R3-17 signs, but they’re now optional anyway. In other words, it has all the physical characteristics but is simply not designated. Dan Gutierrez That’s as absurd as saying that the rest of the road is not a highway because it’s not designated. However, aren’t you legally better of with a shoulder than a BL, because the FTR law does not apply to a highway shoulder, which is NOT part of the roadway, whereas a Bl is a roadway portion of the highway, and thus subject to the FTR law. Richard C. Moeur If it is an area on the roadway pavement surface delineated by a solid white line and also containing standard bicycle lane symbols as defined in Part 9 of the MUTCD, then I would think that it would be rather difficult to claim that such an area wasn’t a bike lane. As you’re aware, NCUTCD has recommended a clarification to the language in Chapter 9C to reduce any ambiguity, but even with the existing wording it would be difficult to say it isn’t a bike lane once the symbols are added. Barry Childress We had a planner in Balto city that said “When I call a sidewalk a side path it’s a side path.” There is a truth in that but it is up to the advocates to advocate for standards. Additionally the law may look at things differently then how the planners look at things. On the flip side in Maryland we have been pushing for “curb lanes” (when AASHTO standards cannot be met) either as an optional place to ride or to keep lane widths narrow (depending what spectrum of cyclist you are talking to.) Since cyclists were requesting these MDOT decided to put a tiny biker dude in a 2.5′ curb lane to make it a bike lane. We complained, so MDOT promised to take out the stripe and the designation. Heavy sigh, some concepts are just hard to get across. Ed Beighe ‎Dan Gutierrez: right, that would be my understanding. I just crave consistency. This is in a part of the state i don’t frequent. Mike Schwab In Illinois, a stop sign is enforceable, even without an ordinance. Conversely, an ordinance requiring you to stop is not enforceable if there is no stop sign. John Schubert There is a national epidemic of calling everything to the right of the fog line a “bike lane.” But, as miserable as most bike lanes are, they aren’t one percent as unsuitable for cycling as many thousands of miles of shoulders. Potholes, drain grates, sight triangles, arbitrary narrowing and ending…….. shoulders are not made to any standard, and I strenuously oppose “promoting” them by calling them bike lanes. For that reason, it needs the official markings. And the markings need to be approved by an engineer who understands this stuff. And if the engineer doesn’t approve, and it doesn’t get the markings, everyone is better off. Dan Gutierrez So, if a bicyclist were to control the nicely narrowed travel lane, would the police cite for the FTR law because they would treat the shoulder as part of the roadway? John Brooking Harkening to John Schubert’s comment, I have discovered a problematic tendency in Maine to refer to paved shoulders of suitable width for bicycling but without a bicycle icon as “bicycle shoulders”. I have heard this from various advocates, who recall hearing it from engineers at the DOT and consulting firms. It seems to be a made-up concept that has taken hold locally. Kenneth O’Brien might point to it as a result of advocacy on the part of bicycle groups in the last decade to promote paving shoulders as a “bicycle improvement” for a state with a lot of rural roads, and I could totally see that. Ed Beighe ‎John Brooking, i have heard that same phrase “bike shoulder” widely used in Tuscon area. Bob Sutterfield http://bikeportland.org/2012/01/12/after-activist-action-odot-repaves-danger-spots-on-hall-blvd-65087 In BFC Platinum Portland, bikeway advocate commentators muddle the difference between bike lane and shoulder. Jason Walker I dunno’ man. It seems like improving a shoulder in case a cyclist chooses to use it (And here I am assuming cyclists are NOT required to ride on the shoulder in OR.) is a good thing right? Are you thinking that the writer of the article should have mentioned that it was a shoulder and not a bike lane? Ed Beighe ‎Jason Walker, regardless of the official designation, and regardless of laws, and regardless of the amount of space — cyclists are expected to ride to the right of the white line… so that’s a problem. Wayne Pein John Schubert’s epidemic is at least in part attributable to a 2004 report produced by the University of North Carolina Highway Safety Research Center in cooperation with the State of Florida Department of Transportation, the USDOT, and the FHWA for the Florida Department of Transportation. Those entities could and should have squashed “undesignated” bicycle lanes, but the report is flawed and is still up on the FDOT website (along with other fatally flawed reports). Ed Beighe ‎Jason Walker, we (arizona) has some pretty good results, e.g. see these three cases http://azbikelaw.org/take-the-lane/ But the troubles in Flagstaff are unresolved; it is more than one judge, and more than one LEO (plus a problematic prosecutor’s office, so i suppose you could say more than one prosecutor). Flagstaff is BFC silver by the way. Jason Walker Good lord. It seems no matter how many layers of law I see or decisions regarding this sort of thing, it always come back to confusion about and / or abuse of, FTR laws. I’m starting to think this is MOST misguided regulation in regards to cyclists. Ed Beighe ‎Jason Walker, i honestly don’t think it would matter. Note that in the last criminal obstruction case, the cyclist wasn’t charged with any transportation code violation (FTR or any other). My surmise is the prosecutor, after having his first criminal obstructing charge dismissed, told police NOT to charge him with the ftr law, and that it would then be easier to get the criminal conviction. Jason Walker What do you think would be an appropriate solution? Jason Walker Regarding my above comment: Clearly, fighting the same legal battle over and over again is pretty foolish, and that seems to be what’s going on. Ed Beighe ‎Jason Walker; i guess a trial with a lawyer (on both sides; there’s always a lawyer for the city — which is in itself odd; traffic matters rarely have a prosecutor, however the city of Flagstaff takes an unusual interest in cases where cyclists use the road), along with expert witness testimony. I’m guessing this would cost the defendant on the order of $10K (but really don’t know. anyone?). Then, it would be good if he lost that case. (otherwise it would simply be an expensive victory; and the city could simply continue harassing him). Then it would have to go to our Court of Appeals. another lots of money, i guess. Then it better win, otherwise we would all be screwed. In short; i don’t know! it’s full of pitfalls. Dan Gutierrez This whole issue of “designation” varies from state to state. In CA, the vehicle code and streets and highways code require that for a bike lane to be subject to the mandatory use law, the facility must be designed to state standards and employ state standard traffic controls, otherwise it’s not mandatory. This issue of “designation” does not come into play here. If for example a facility does not follow the legally required standards, then it’s NOT a legal bike lane and therefore not mandatory use. Jason Walker I used to ride a 16-ish mile commute that contained some sections of marked “bike lane” that had, I kid you not, maybe 1′ of asphalt and then the gutter pan. Jason Walker Funny, the area I’m talking about is ALSO Sacramento. Might be a Sac thing. Terrible. Dan Gutierrez No, I see such problems in Long Beach, Oakland, and other smaller cities like LaPalma. As far as I can tell, it stems from the kind of ignorance the “Understanding Bicycle Transportation” course is designed to remedy. Jason Walker Ouch. Is this the course you teach that I see you refer to here? Ed Beighe ‎Dan Gutierrez “varies from state to state”. I’m still looking at our state laws… haven’t seen anything like that, but i’ll keep looking! we also have a supplement to MUTCD (though nothing in there is specific to bicycle stuff, i.e. there’s no part 9). On Pima County’s Bike Map. Note the predominace of red versus yellow. Tuscon/Pima’s Bicycle Friendly Community 2012 application materials. Their steadfast avoidance of the term “bike lane” or “bicycle lane” borders on the comical, e.g. Att6-TucsonRoadwayDevPolBike mentions bike routes with edgelines and so forth a half-dozen times, yes doesn’t utter bike lane once (well, perhaps once by accident)! It also references a City of Tucson Bike Route Striping document, which i mentioned above and have a local copy of, which is particularly disingenous with regard to markings “2. Optional word of symbol legends may be used to define bicycle facilities, as described in the (MUTCD). The legends, when used, may be placed at intervals and locations matching the D11-1 signing, or as otherwise identified by the (MUTCD)”. This is a complete mis-representation of REAL Bicycle Lane markings, and REAL Bike Lane signs (R3-17, and NOT D11-1) in the MUTCD. Oh the word legends? It’s, ummm, “BIKE LANE”, see MUTCD 9C04. …As a side note, the City of Tucson currently does NOT have bicycle “lanes” despite words in the news to the contrary. The City Engineer under A.R.S. §28-736 [probably meant to say 28-636; powers of local authorities.? 736 relates to hov lanes] and other regulatory rules may designate “lanes.” However, such has not occurred for cycling in Tucson. I recently called the Tucson City Engineer’s office and asked about why we have news articles and police reports that refer to “lanes” and why citations are issued based on “lane” use when indeed we do not have “lanes.” The answer was somewhat surprising. The people I spoke with never saw the need to pay attention to the precision of this language useage. They call the right side of the roadway a “bike route with striped shoulder” [BRSS] as an official term because the MUTCD (Manual on Uniform Traffic Control Devices) requires additional signage and striping and distances for an official bicycle “lane” which is simply impossible at the present time to accommodate. So apparently the “official” system is the “route with striped shoulder” and the unofficial verbal communication is to go ahead and call it a “lane” for convenience of conversation. where quotes were attributed to a law enforcement officer that cyclists should ride in the “lane” and if a “lane” is not present then (and presumably only then?) a motorist should give 3 feet clearance while passing. We have motorists who believe there are bike lanes and cyclists should be in them and if not then the 3-foot rule does not apply. This misnomer must be corrected for the safety of all cyclists in Arizona. Enhancing the penalty for violation of the 3-foot passing rule is a good way to correct this misnomer. Bicycle Route, with Striped Shoulder. Sometimes pluralized, e.g. Bike Route with Edge Line; Bike Route with Edgeline; Bike Route with Edge Stripe. Google searches reveal a *heavy* concentration of hits on these terms to lead straight to Tucson and/or Pima County. I asked one of our local bike lawyers about this awhile back and he agreed. If you feel otherwise I’d like to hear your thoughts. I just noticed there are two different bikeway maps covering Pima county, one put out by pima co DOT, at pima.gov‘s DOT and another put out by PAG (Pima Assoc of Gov’ts) the PAG map marks almost everything in blue, including the Dodge Bridge hot mess, which according to the key is a “Bike Lane”. The PCDOT map is the one that still refers to the bike route with striped shoulders, using the red key color. Here’s an example of a “bike lane” (per pagregion.org map) in the City of Tucson, Grant Ave around 4th, about 3′ total width from curbface (no gutter there? ), including the overgrown areas… so about 1′ usable. I reread this page, and the situation is actually more convoluted than I thought, althought the MUTCD FAQ seems to clearly indicate the intended interpretation and direction. Thanks for all the detailed references. |locations as needed. The bicycle lane symbol marking shall be white. |*other* word or symbol messages, it shall precede them. Emphasis added; 2009 does not say “other”, and symbols are no longer required to be placed “immediately after an intersection”, which I think is unfortunate. The only reason I can think for that change is that “intersection” could be interpreted to mean “every intersection”, including residential/commercial or could just be quite frequent (500′) in downtown areas. I think there should at least be some kind of maximum distance between the markings. |and shall be placed at periodic intervals along the bicycle lanes. In 2003, symbols (which are optional) require use of signs. Signs could be used when there is a stripe only, without symbols. Right? |and pavement markings for preferential or exclusive use by bicyclists. |Longitudinal pavement markings should be used to define bicycle lanes. IMHO, the definition which is a standard/”shall” carries more weight than the guidance/”should”, so 2003 required signs. |Standard: 02 Longitudinal pavement markings shall be used to define bicycle lanes. deliberately changed to be optional). The draft fix addresses this, changing the definition of a bicycle lane to be “longitudinal marking and symbol”. The latest 2003 MUTCD is better than the latest 2009, but the 2009 with ammendment is slightly better than latest 2003.
hard requirment, and one is a soft requirement. That is the topic of draft fix. Notes on MUTCD 2000 versus 2003… Seems (without explicitly comparing them) substantially the same as 2003 MUTCD. 7. Bicycle Lane–a portion of a roadway that has been designated by signs and pavement markings for preferential or exclusive use by bicyclists. 1. Bicycle Lane–a portion of a roadway that has been designated by signs and pavement markings for preferential or exclusive use by bicyclists. Bicycle Lane (R3-16 and R3-17) signs shall be used only in conjunction with the Bicycle Lane Symbol pavement marking. Bicycle Lane signs shall be used in advance of the beginning of a marked bicycle lane to call attention to the lane and the possible presence of bicyclists. If used, the Bicycle Route or Interstate Bicycle Route markers should be placed at intervals frequent enough to keep bicyclists informed of changes in route direction and to remind drivers of the presence of bicyclists. Longitudinal pavement markings should be used to define bicycle lanes. (I would like to see that requirement resurrected, without “with used”). Signs shall be used with preferential lane symbols. As indicated in Section 3C.02, obstructions within the bikeway shall be marked with the appropriate object marker or delineation. Notably, there is no mention of “right turn lanes”, as in 2003 and 2009 MUTCD. In 2000, the BL ground markings were 4ft tall, whereas in 2003 (and 2009), they are 6ft tall. between the definition of a bicycle lane; and Chapter 2G which mentions preferential lanes for bicycles, but then inexplicably doesn’t include them in the list of preferential lanes. And Chapter 2G is internally inconsistent in that it refers to preferential lanes for bicycles a couple of times. However, in the lists of preferential signs and plaques (Table 2G.1 , or Figure 2G.1), the Bike Lane sign is nowhere to be found anywhere in Chapter 2G. Gary Cziko said: Dan, according to the 2012 AASHTO bike guide (from Figure 4-13), there seems to be to be lots of room between a cyclist in a 4-ft bike lane and an SUV in the adjoining travel lane. Did you make your SUVs too big. Or did the AASHTO folks learn some tricks from the Chicago folks and shrunk the motor vehicles? “full-size” pickupFord F-150 79.9″ w/o mirrors, 97″ with standard mirrors. Here’s a typical sedan, a ford Taurus: 85.7″ (yes including mirrors), so just over 7′. Retrieved 4/2015. … of course you can get bigger mirrors. There is an overall limit of 102″, but for some reason that is the measurement without mirrors. And of course you can get wider (“dualie”) bodied pickup trucks. 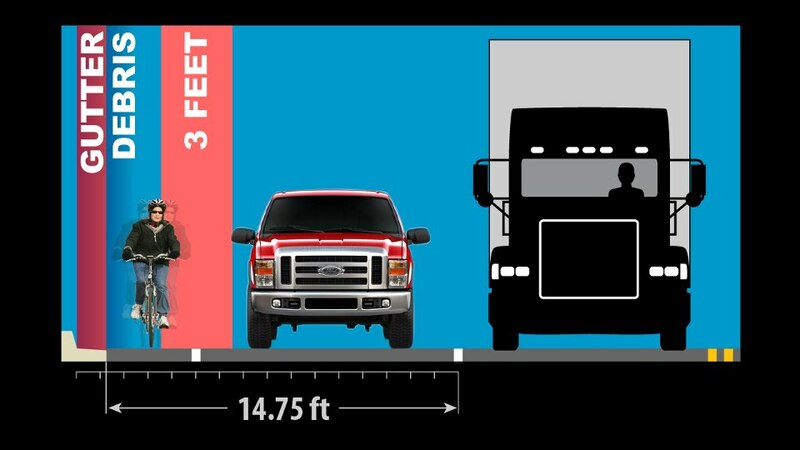 This illustration below from Kerri Caffrey / iamtraffic.org shows to-scale the trouble with standard (5′) BL next to an 11′ lane — even a run-of-the-mill pickup truck cannot give the required 3′ of passing clearance. Also see this fb discussion thread. The detailed critique has nice diagrams along with direct quotes from the 2012 AASHTO guide. 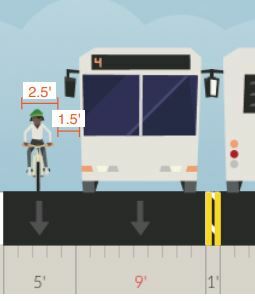 The diagram at right shows a “standard” 7′ parking lane + 5′ bike lane + 10′ travel lane with actual-scaled objects (the red outline is to represent the door zone). so many good graphics: this one shows a 12′ lane divided into 40″ for the bicyclist (30 plus wobble) and a 104″ pickup truck (e.g. F-250. an F-150 is about 7″ narrower); with ZERO clearance. Looks like maybe iamtraffic.com’s work? Subject: Re: what became of this issue about clarifying bike lane markings? an Interim Approval being issued for this change. Subject: RE: Status of clarifications on BL markings? You are correct that the bicycle pavement marking symbols (both the bike symbol and the helmeted bicyclist symbol, as shown in Drawings A and B in Figure 9C-3 in the 2009 MUTCD, respectively) are 72 inches tall and 40 inches wide. These symbols were shown on a grid background in Figure 9C-6 in the 2003 MUTCD. They are not shown on a grid background in the 2009 MUTCD because that information became available on a grid background in the 2004 Standard Highway Signs and Markings book (see Page 10-16 at http://mutcd.fhwa.dot.gov/SHSe/Pavement.pdf). You are also correct that the bicycle symbol used in conjunction with the shared-lane marking must be the same size (72 inches tall and 40 inches wide) and design as the bike symbol shown in Drawing A in Figure 9C-3 in the 2009 MUTCD. No other size or shape is permitted. With contributions by Daniel A. Gutierrez, M.S. Presentation slides, based on iamtraffic.org’sUnderstanding Bicycle Transportation (UBT) slide set. 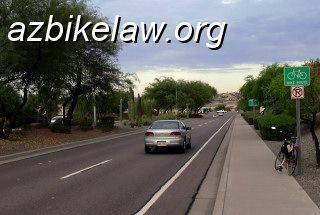 Interesting article about bike lane markings by Arizona attorney Kevin Fine. • Adjacent to on-street parking, the minimum bike lane should be 5 feet. • On highways with concrete curb and gutter, a minimum width of 3 feet measured from the bike lane stripe to the joint between the shoulder pavement and the gutter shall be provided. Class II bikeways may be included as part of the shoulder width See Topic 302.